Close but not close enough as BOGS are pipped by BYGEMYST & Late Arrivals yet again - January 2019. 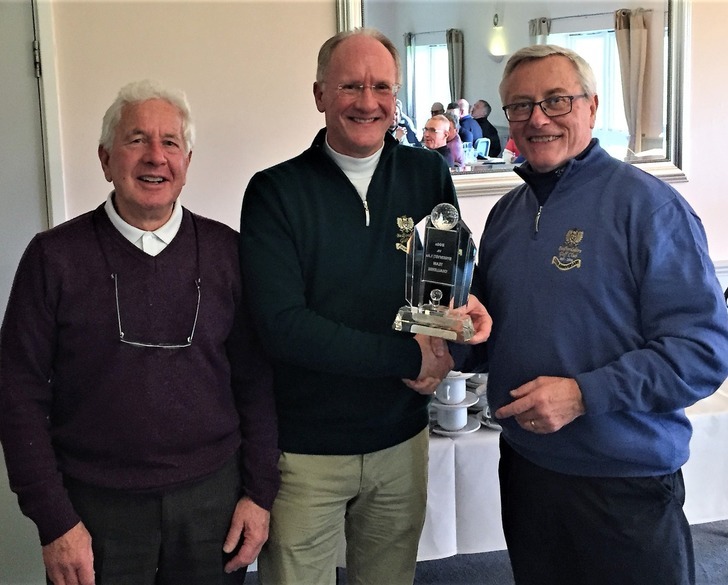 In what is now the competition's 8th year, the three big Saturday men's social golf groups, battled it out in the BOGS vs. BYGEMYST & Late Arrivals Team Annual Challenge. Always a popular and keenly fought contest, there was a record turn-out with no fewer than 92 players making up 23 matches between the two sides. The BOGs were hoping for a much needed win after considerable losses over the last 3 years. With some new, younger and fitter blood in their team there was renewed hope and optimism from the BOGS captain John Farnworth for a change in fortunes. 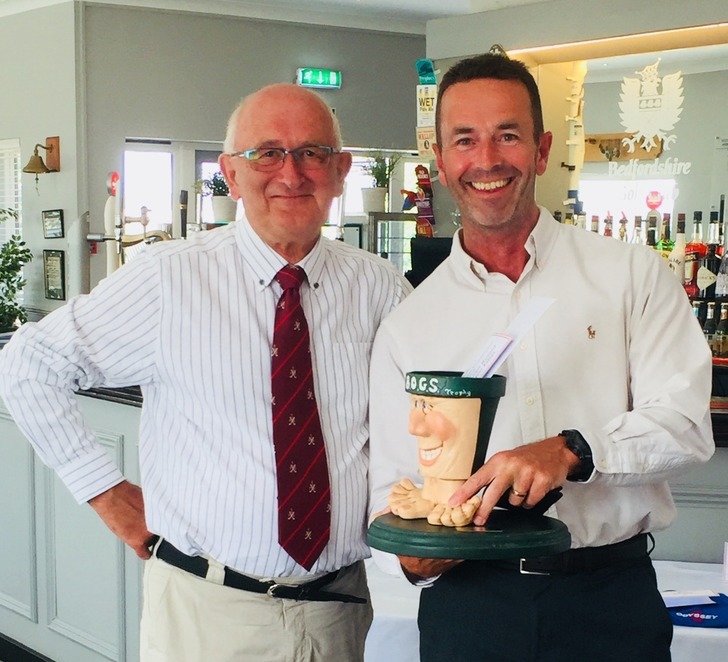 Early results were looking promising for the BOGS and with half the matches completed it was very close with the BOGS actually ahead by 2 matches – although still behind by overall holes won. 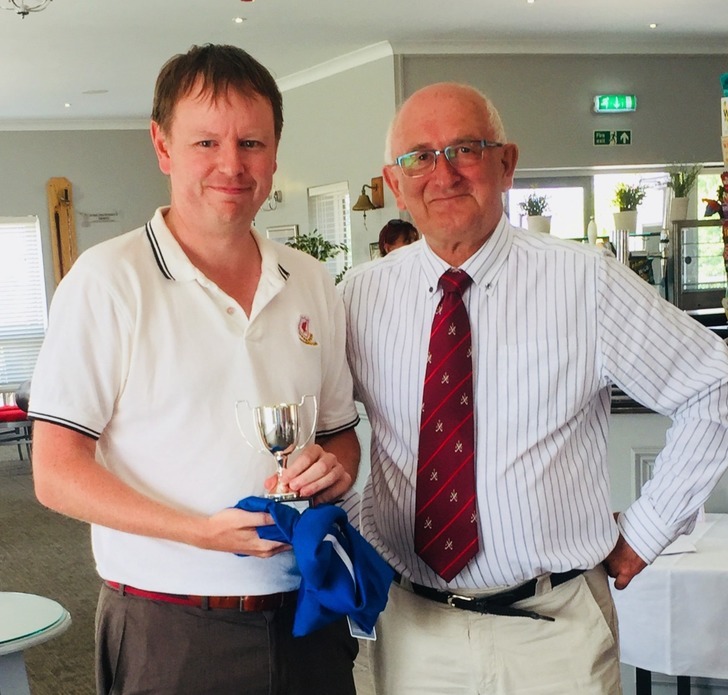 Both teams performed admirably particularly during the downpour someway through the round that clearly had an influence on some of the scores. 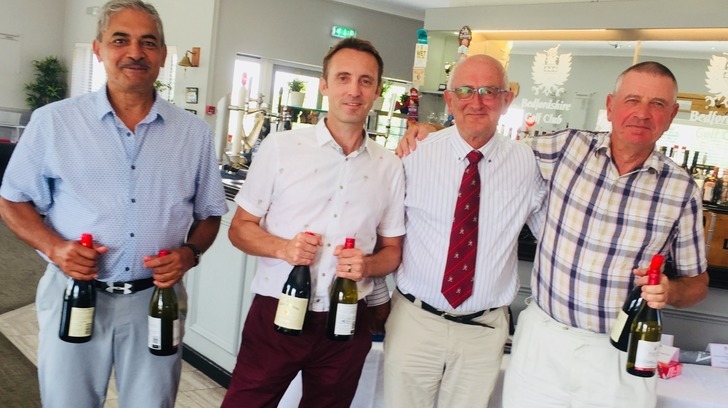 However, the overall result saw the combined BYGEMYST & Late Arrivals team secure another notable, but much closer, victory of 12 matches to 11 (Based on Ryder Cup scoring) and an overall holes up score of +14. 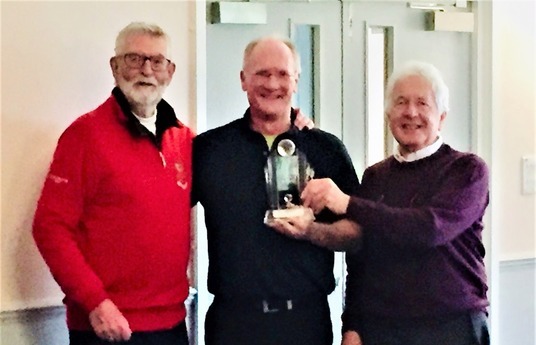 Although this ensures their 12 month bragging rights, the BOGS were heartened by the much closer margin of defeat than in the previous 3 years showing that the pre-match winter training regime is paying off and likely to yield a better result if not a victory in 2020! 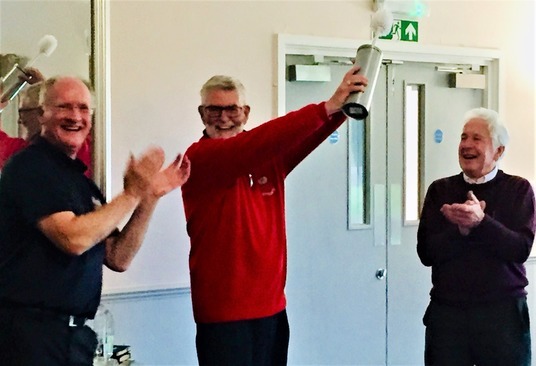 Following an excellent carvery lunch in the Biddenham Suite, BOGS Captain John Farnworth presented the winners trophy to joint winning Captains Clive Haywood & Geoff Gooding (seen pictured here). 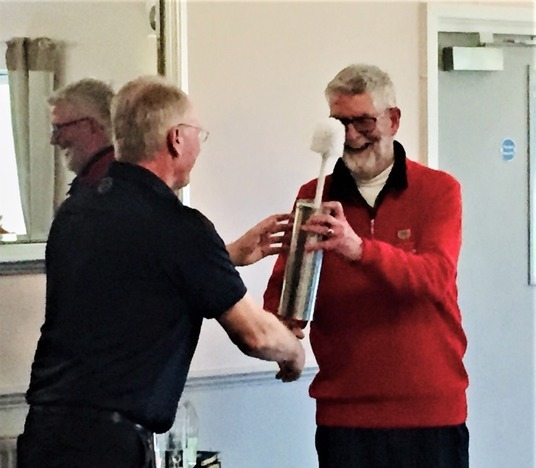 In return and with much glee, Clive presented the traditional runner's up trophy of a lavatory brush to John Farnworth (also pictured). 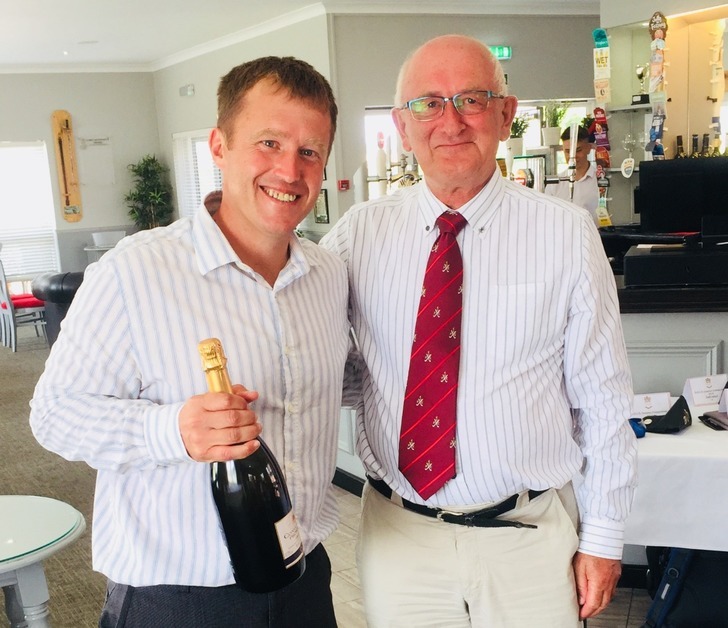 In his runners-up speech John challenged the BYGEMYST/Late Arrivals team to fully integrate from 2020 and have one member from BYGEMYST & one from Late Arrivals in each of their groups. of each of their groups in their pairings. The suggestion was fully supported by both Clive and Geoff. Another excellent competitive but social event enjoyed by all and Game On for January 2020. Captain of the runner's-up with their trophy! B.O.G.S Summer Competition - 21st July. A number of member based social golfing groups exist within the club.